Remember when ESPN punished analyst Curt Schilling for equating Radical Islamists with Nazis in a Facebook posting last month? Well, it makes one ask, shouldn’t ESPN also punish Tony Kornheiser for saying that tea partiers are just like ISIS terrorists? We’ll see if ESPN is consistent and punishes Kornheiser like they did Schilling. In August, as you may recall, Schilling was penalized for posting a graphic on social media that said that only 5-10 percent of Muslims are extremists, then noted that only 7 percent of Germans in 1940 identified themselves as Nazis. The image ended with the quip “How’d that go?” Schilling was suspended from his job as a commentator and analyst for the cable sports network. It was clear that Schilling wasn’t suggesting that all Muslims are terrorists and that it only takes a few to turn a society to the dark side, but ESPN folded to pressure and punished the former baseball star anyway. 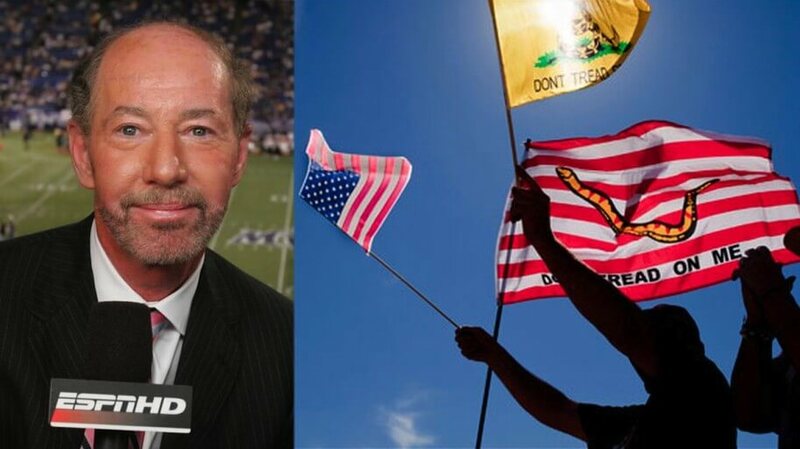 This month, though, ESPN commentator Tony Kornheiser said a far worse thing abut members and supporters of the tea party movement, claiming they are somehow all like the terrorist killers of ISIS. While interviewing Huffington Post editor Howard Fineman, Kornheiser asked about the House Speaker race and if leading candidate Paul Ryan will be able to gain the support of the Tea Party. FINEMAN: Paul Ryan has enough conservative chops, that he can sort of try to unify the whole party. But, he’s going to be spending all his time trying to deal with these Tea Party people. What he’s probably going to have to do, if in fact he gets in, is stage some kind of fight with them and defeat them, or take away their power, and go after them. I don’t know if he’s got the guts to do that. I don’t know if he’s got the numbers to do it. KORNHEISER: Are they like ISIS trying to establish a caliphate here? FINEMAN: Yes, yes! That’s a very good analogy. Without the violence obviously, but yes, they are a rejectionist front. They don’t want to legislate. With the two situations in mind, as Twitchy notes, social media has erupted in calls for ESPN to punish Tony Kornheiser like it did Curt Schilling.